Multi-user has a user management window for managing multiple users. This dialog box is used to set user information. The user information includes the user name and password for logging in server. 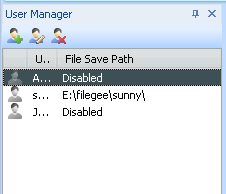 The last option is used for users to enable the file transfer channel between server and client. For details, please refer to How to transfer file through inner channel of multi-user network version without using FTP or share path?